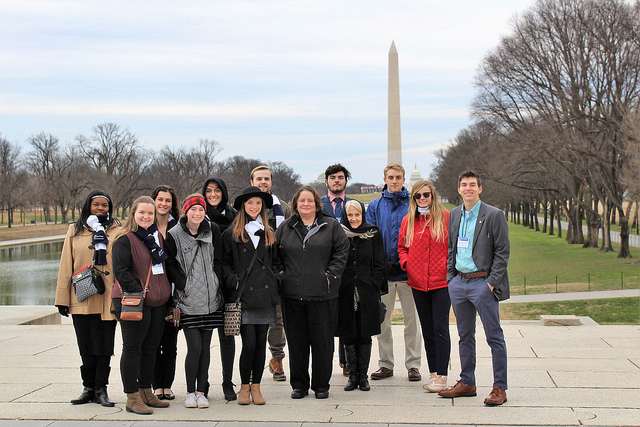 During January, students journeyed to Mexico, Hawaii, Prague, Japan, and Washington D.C. 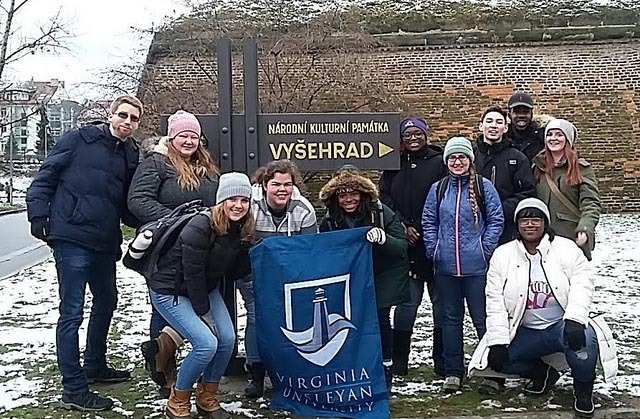 Exploring Mayan ruins, Prague Castle and a taro farm are just a few of the ways Virginia Wesleyan students spent their time in January. Some of the sixty-one courses offered during Winter Session, the University's three-week credit-bearing term held each January, provided students with opportunities to study away, earning credits as they explored different parts of the world. Several students who participated in the travel courses presented to the campus community upon their return, during a “Cheers in Greer” session on January 24. They told about their experiences, recounting adventures and sharing reflections on what they had learned and the impact studying away had on their lives. Others shared their experiences by maintaining blogs about their journeys. A group of VWU Batten Fellows participated in the "Batten Fellows Leadership Institute," when they attended the Continuity and Change in American Leadership program offered by the Osgood Center for International Studies in Washington, D.C. They had opportunities to meet accomplished professionals and learn about the American political process, attend significant Washington events and ceremonies, and visit diverse agencies and locations while traveling with VWU faculty members Joyce Easter, Dean of the Batten Honors College and Professor of Chemistry, and Kathy Merlock Jackson, Professor of Communications. From memorable visits to places such as the Lincoln Memorial and the U.S. Holocaust Memorial Museum to the U.S. Capitol Building, the Library of Congress and the Newseum, the students intensely studied leadership and refined their definitions of the concept. For freshman Emily Smith, the most significant part of the D.C. experience was hearing about so many successful people's tracks through life, and how both their failures and successes have shaped them in to who they are today. She says that she learned that the best leaders listen first, and they are constantly learning. The most successful leaders share their failures, instead of hiding them. “Service over self” was one of her favorite leadership practices. Freshman Tess Jones who grew up very close to Washington, D.C., has long enjoyed the diverse backgrounds of the people around the Washington, D.C., area. She considered spending time in congressional offices and the Senate gallery during the course a powerful and influential experience. Freshmen Molly Delmont, Tatiana Crawl, Destiny Kinka and Sarah Farkas told about their experiences in Mexico as they presented on behalf of the group who traveled there during Winter Session. The Batten Honors College Trip to Mexico was designed to combine perspectives based on the sciences and the humanities, as students traveled to the Mexican cities of Valladolid, Chichen-Itza, Tulúm, Mérida, Dzibilchaltum, and more. 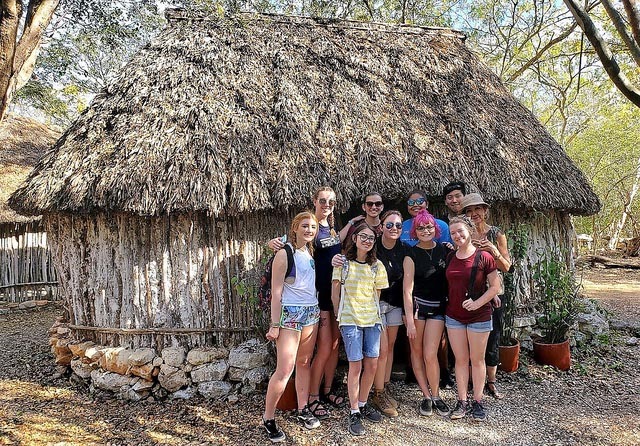 Along with VWU Professor of Hispanic Studies Diana Risk and Professor of History Dan Margolies, the students explored the Mayan civilization in a region where human activity has been active since ancient times. They embarked on the Puuc Route, exploring Mayan ruin sites spread across the Yucatan. They had opportunities to contrast the ways in which different societies transform and adapt to the natural world. Experiencing “Travel’s Impact on Culture and the Environment” enabled students traveling with Professor of Recreation and Leisure Studies Doug Kennedy and Assistant Vice President for Student Affairs Jason Seward to examine the impact that adventure travel has on culture and the environment as they explored Hawaii. 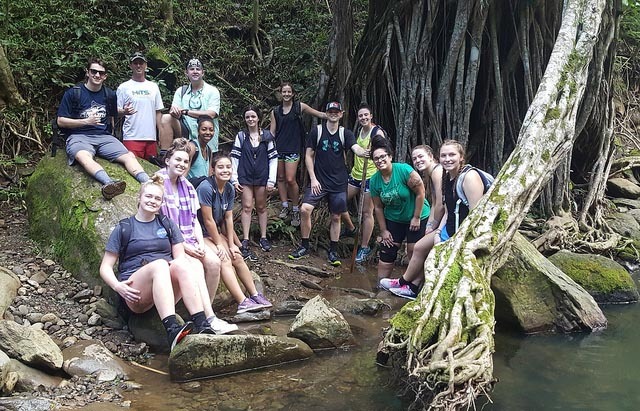 Senior Maribel Veras, a Latin major and Classical Studies and Business minor with Peace Corps Certification, most enjoyed getting to know the locals on the island of Maui. She says she developed a great understanding and appreciation of Hawaiian culture during their many activites there. While visiting a taro farm, she helped out by cutting weeds and then stomping them into the ground while listening to one of their hosts, Auntie Tweetie, play the ukulele. It’s a memory she won’t soon forget. During “Seminar in the History of the European City: Prague” students traveled with Professor of History Sara Sewell to investigate the history of the European city, focusing on the history of art, architecture, city planning, and public spaces. Through walking tours, visits to museums and key landmarks and musical performances, they investigated the historical developments of the city, especially the conflicts radiating from the construction and destruction of the urban landscape, and studied generations of Czech history. The students examined styles of architecture, attended a concert at St. Nicholas Church in Prague's Old Town, hiked to the legendary Vysehrad castle grounds, took an art tour through the Convent of St. Agnes, spent a day at Prague Castle and visited places like the Terezin concentration camp, and more. Students maintained a blog during their travels, sharing their experiences and thoughts. Joyner wrote that hearing of these dark times and the death and suffering that followed made him wonder if the world has truly changed. Senior Genesis McDaniel, a social work major and Junior Thomas Reinhold, a music major, journeyed to Rikkyo University (RU) in Ikebukuro, Tokyo, Japan in January as part of a scholarly exchange and collaboration agreement between Virginia Wesleyan and RU. 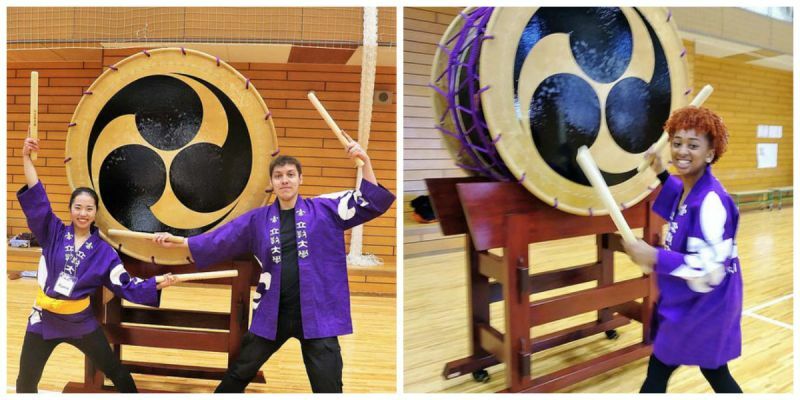 They participated in RU’s January Japanese Cultural Immersion Program, which is comprised of 45 hours of instruction and 25 hours of lecture on Japanese culture and society, and field trips to points of interest. In addition to courses on Japanese language and culture, they had the opportunity to participate in a homestay. For students, studying away is a life-changing experience, one that transforms the way they perceive the world. Virginia Wesleyan's study-away programs are coordinated by The Lighthouse: Center for Exploration and Discovery which provides advising and financial assistance to prepare students for study away and to translare their experiences in to personal successes. Students interested in semester study abroad or VWU’s study-away courses are eligible to apply for The Lighthouse’s competitive study-away grants. For more information about Winter Session or Study Away Programs, visit Virginia Wesleyan’s website.